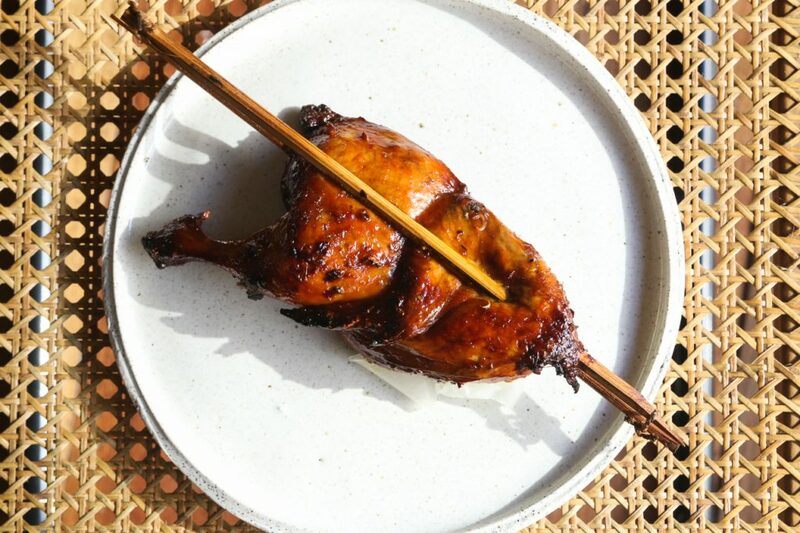 It's skewered and grilled but Lampara would rather call their masterpiece a "chicken dish"
How do you make a newcomer stand out in a place already saturated with bars and restaurants such as Poblacion? The answer may be as simple as setting up lots of chairs—chairs inspired by iconic ones like Hans Wegner’s “Papa Bear,” Michael Thonet’s “209,” and Marcel Breuer’s “B32/Cesca,” among many others. Well, and of course, good food. Good Filipino food, that is. Enriquez St. was once a quiet residential corner now brims with new crowd-pleasers. This includes Lampara, a neo-Filipino restaurant, and bar occupying most of the second floor of a renovated apartment complex. Owned and manned by three Enderun alumni, Lampara aims to fill the gap between dining and drinking places in the area. 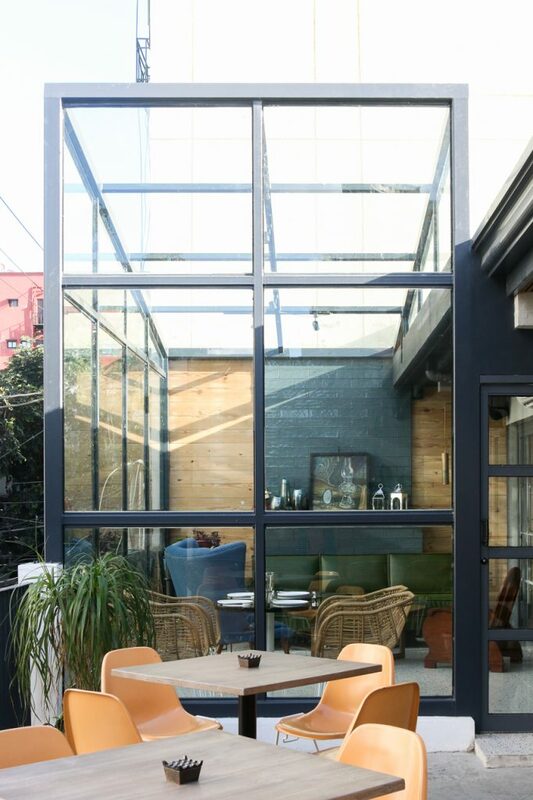 “Poblacion is known to be a good place to drink like hole-in-the-wall bars,” RJ Ramos, one of the owners says as we cozy up in their air-conditioned patio enclosed by glass. “But we felt like kaya pang magkaroon ng restaurant kasi kailangan mo ring kumain before drinking. And there are pretty good options here–” “But there’s still room for more,” echoes his co-owner, Prince Tan. And fill that room they did with the help of custom furniture maker and interior design firm Space Encounters. 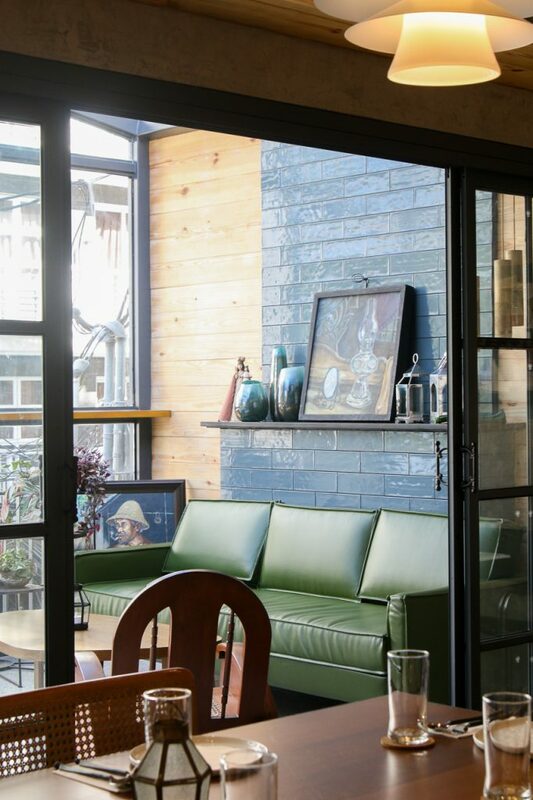 “We wanted it to feel homey and to match the residential neighborhood vibe. 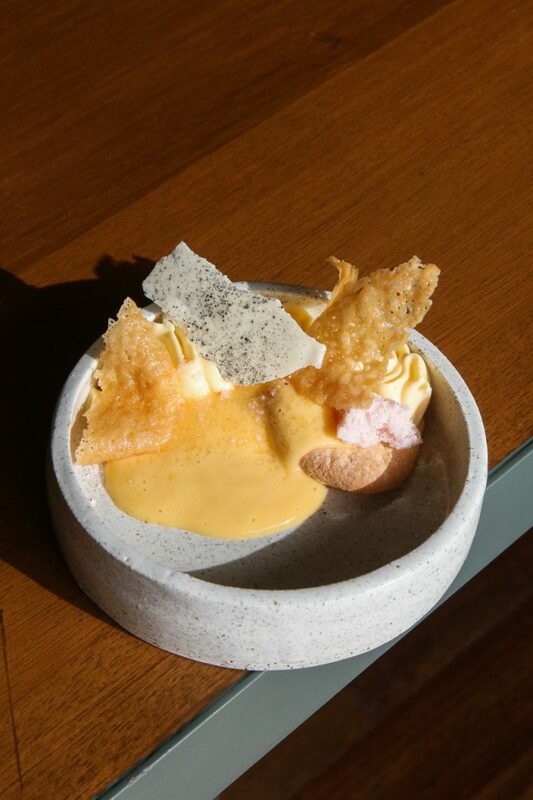 Like drinking at a friend’s house where you could grab any chair and sit on it,” shares Alphonse Sotero, part-owner and Lampara’s dessert chef. But more than jiving with the area, it also reflects their approach to food which they described as Neo-Filipino. 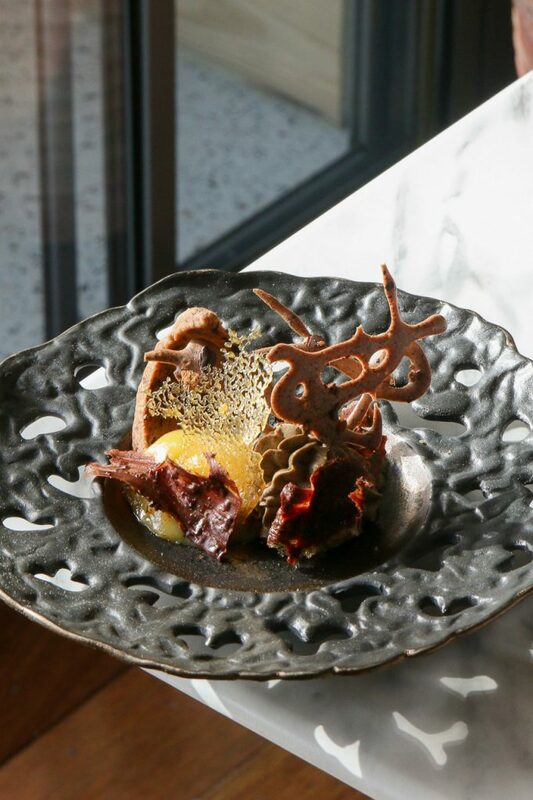 What exactly is new about the Filipino food at Lampara? Everything on their menu is a take on a classic fare but you wouldn’t know it just by looking at the plate. 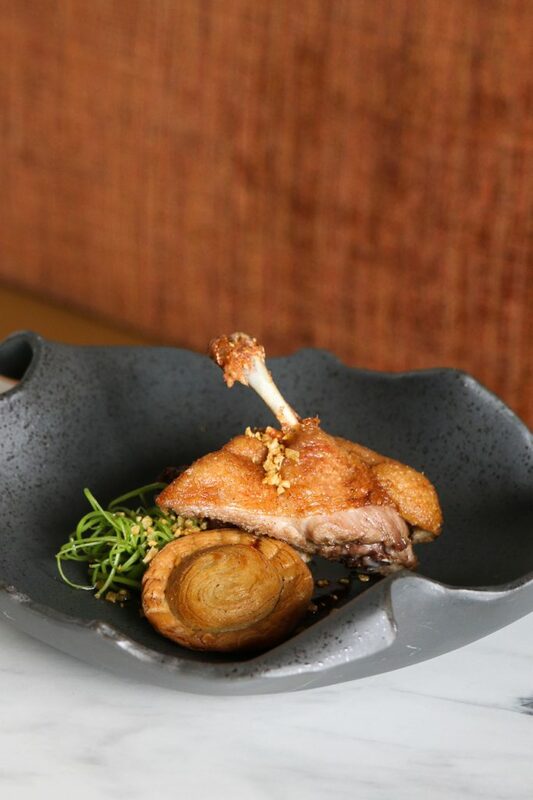 The duck leg, for example, exudes a sophisticated fine dining feel but a single bite into it will instantly induce flashback of your fondest memories of home cooked adobo. It’s plated with shredded kangkong and liver paté kaliskis, Bulacan’s version of empanada. 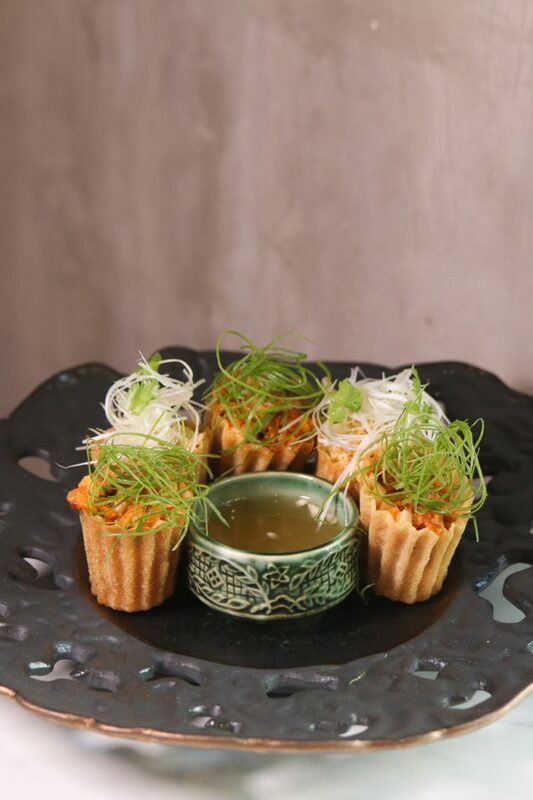 The same is true of their rice cups appetizer filled with longganisa or tofu and ubod which takes its cue from two different versions of lumpia. “We try to elevate the food through the techniques we’ve learned from school and the kitchens we worked in but I’d like to think that the taste is still Filipino,” Ramos, who like his co-owners interned abroad and worked in local kitchens like Hey Handsome, explains. Another avian pleaser takes the form of a well-loved (and ubiquitous) favorite originating from Bacolod. It’s skewered and marinated the usual inasal way, except it’s cooked slowly prior to being grilled ala confit. But they would rather call it a “chicken dish” out of fear of offending purists. “We don’t want to call it inasal kasi baka sabihin ng ibang tao it’s not inasal, or it’s not authentic,” Ramos quips. It’s a combination of three different takes by their chefs on inasal that ultimately resulted to a tender, flavorful, and hefty half chicken reminiscent of litsong manok sold in streetside rotisseries. It’s laid on top of their homemade atsara and served with steamed rice. And what is a Poblacion joint without a bar? 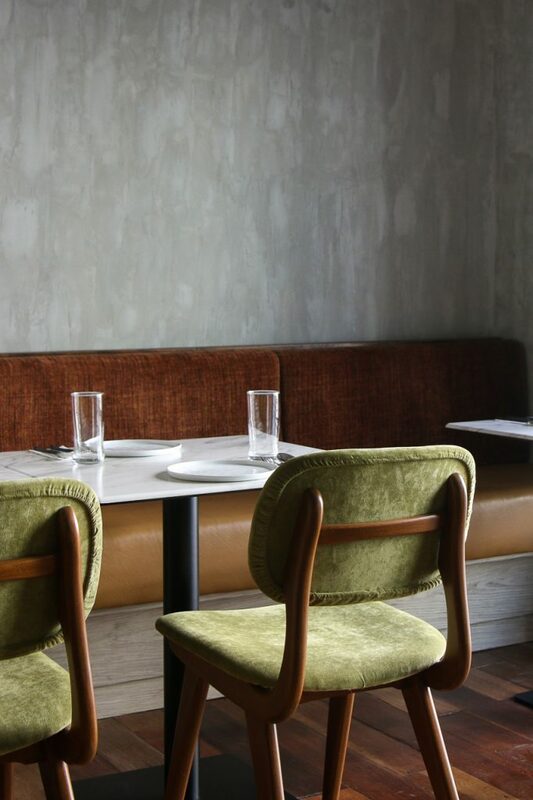 Opening at 6 p.m., Lampara serves the dinner crowd and then it transitions into a bar lounge come 10 p.m. 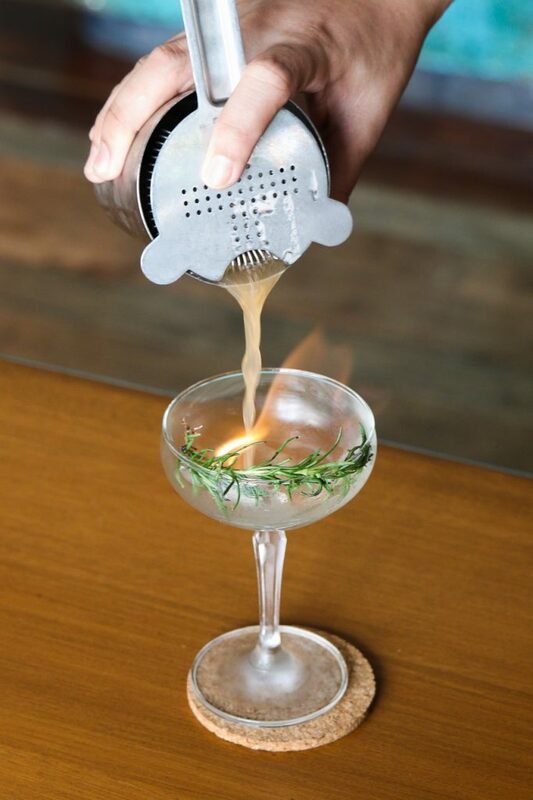 They have four signature cocktails with quirky names from local pop culture. Melon Milk, a dessert based on a fruit drink the chefs grew up with. It has melon soda, ladyfingers, sugar, and coconut tuile with toasted coconut. Yema and Tsokolate comes with toasted barley cream, toasted yema, tablea shortbread, tablea tuile, Malagos nougatine, and honey isomalt to imitate yema’s traditional cellophane wrapper. 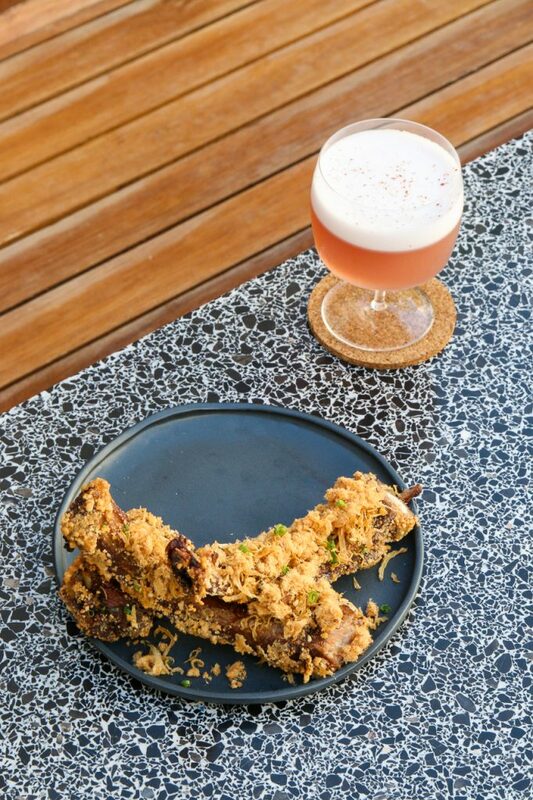 The Asiong, a gin-based cocktail with black currant and cinnamon is paired with their oriental double-fried short ribs. And then there’s the herby, minty rum concoction literally fired up in front of you, called Gasera ni Simoun named after El Filibusterismo’s protagonist. 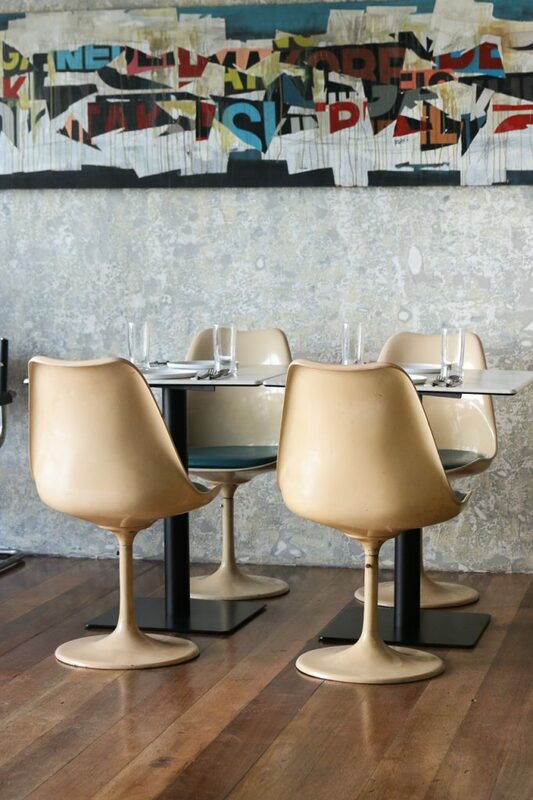 Apart from the food and the meticulously-designed chairs (for interior design junkies), the restaurant also has some pretty good art on display including two paintings by artist Melbourne “Burn” Aquino, whom Ramos is a fan of. One of which, an acrylic on canvas image of a crown on consignment, will greet you as you enter. 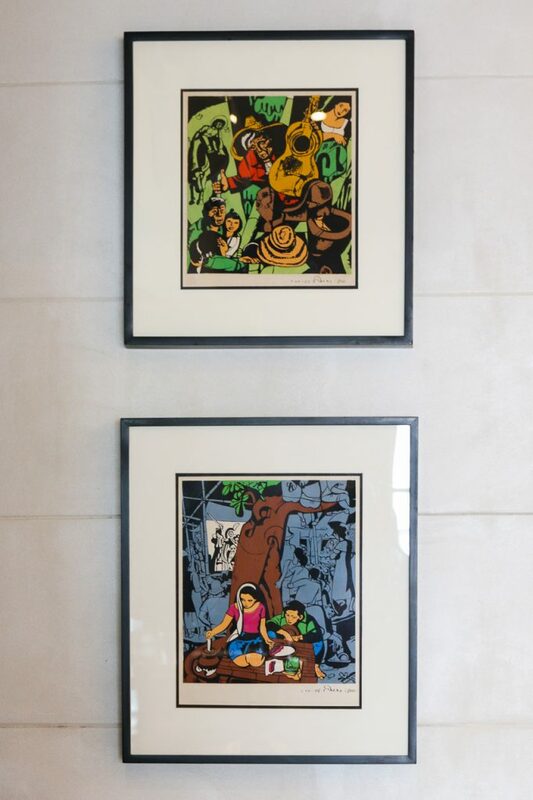 Two Carlos V. Francisco print reproductions hang near the bar, while a 1995 artwork by Julius Samson depicting a gas lamp is the centerpiece of the patio. Their chicken dish, P290 good for sharing, is a quick fix for your inasal cravings. 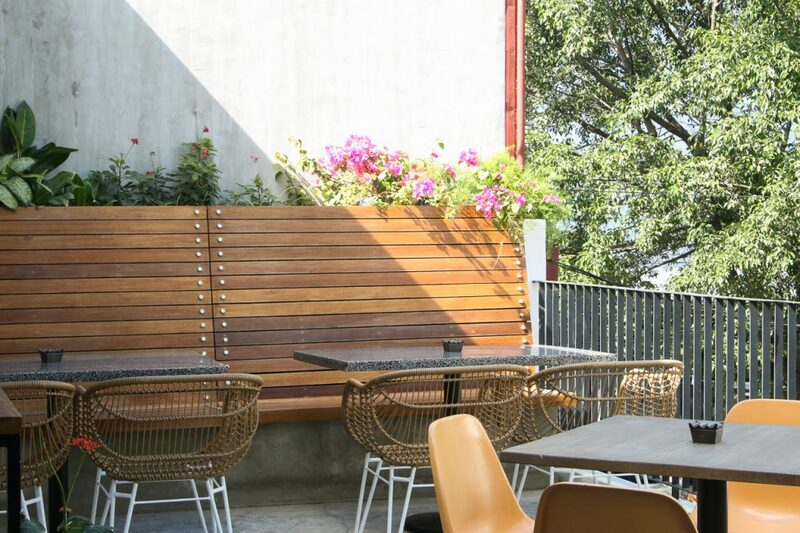 If you're tired of barhopping, you're sure to find a chair of your liking here.